Aerospace manufacturing will continue to demand the best in innovation, productivity and skills development. What follows is a sample of colleges – there are more out there, so please continue your research – that offer licence courses in aircraft maintenance and avionics. Some of the colleges listed here offer programs in more than one discipline. The British Columbia Institute of Technology (BCIT) Aerospace facility is Canada’s largest aerospace technology school. The institute offers accredited programs that prepare graduates for careers as Aircraft Maintenance Engineers (avionics and maintenance) and Gas Turbine/Jet Engine Technicians. BCIT’s Aviation Maintenance Technician – Avionics program consists of 68 weeks of full-time studies. Approximately 50 per cent of the day is spent on theory in a classroom setting, followed by hands-on practical training in the shops and hangar located at BCIT’s state-of-the-art Aerospace Technology Campus. The 285,000 square foot campus is located at the Vancouver International Airport, and is home to all BCIT aerospace-related programs. The facility includes a dramatic 40,000 square foot hangar for the institute’s fleet of light piston, turboprop, corporate and jet transport aircraft, including light and medium helicopters. Successful completion of the program will result in a work experience credit of 18 months of the 48 months required by Transport Canada toward obtaining an Aircraft Maintenance Engineer Category E licence. Northern Lights College (NLC) is B.C.’s Energy College, serving northern British Columbia. Programs at NLC are designed to provide students with the opportunity to obtain the necessary classroom education and supplement that with appropriate practicum or hands-on opportunities to make the successful transition from student to employee. NLC offers Aircraft Maintenance Engineering in the Aerospace Centre of Excellence, located on the Dawson Creek Campus. This 26,000 square foot hangar consists of several helicopters, including a Robinson R44, MD500D, AS350D, Hughes 300C, Bell 205 and 206, and six fixed-wing airplanes including, a Cessna 180, Cessna 310, Piper Aztec 250, King Air B90 and British Aerospace JetStream 31. NLC offers two types of AME training. The 15-month Basic Training program is designed to train individuals wanting to work in the aerospace industry. Graduates receive the full training component and 1.5 years of the four-year experience component required for an AME license. NLC’s Type Training program are field maintenance courses for specific types of helicopter airframes and engines that are Transport Canada approved. The programs meet the training required by regulation prior to exercising the privileges of the AME license to certify maintenance completed on Canadian registered, turbine powered helicopters. SAIT Polytechnic is a member of Polytechnics Canada, a national alliance of leading research-intensive colleges and institutes of technology. The Aircraft Maintenance Technician/Engineer program covers all aspects of aircraft maintenance including general aviation, corporate, charter, transport category aircraft and helicopters. This is a two-year diploma program and all classes are scheduled at the Art Smith Aero Centre for Training and Technology, located at the Calgary International Airport. Some of the courses in this program are web-based and will require students to access information from the Internet. The Saskatchewan Indian Institute of Technologies (SIIT) is governed by Saskatchewan’s First Nation, but also operates within the Saskatchewan provincial post-secondary system. Students enrolled in the Aircraft Maintenance Engineer Training Program will benefit from SIIT’s Boeing Aerospace, Rockwell Collins and Lockheed Martin aerospace and defense companies. Students will develop the knowledge and skills required to complete the approved training necessary to be eligible to apply as an apprentice in the aircraft maintenance industry. Graduates will be credited with 18 months toward the current 48 months of industry experience required to obtain a licence. Red River College (RRC) offers training in all aspects of the aviation and aerospace sector. RRC’s Aircraft Maintenance Engineer program is designed to develop the knowledge and skills in maintenance of both large and small airplanes and helicopters. Aircraft Engineer Maintenance uses a combination of classroom and practical training on a fleet of fixed and rotary wing aircraft to provide the necessary foundation for entry-level positions in the aircraft maintenance industry. The diploma program is designed to develop the knowledge and skills in maintenance of both large and small airplanes and helicopters. Time is split between the study of aircraft maintenance theory and practical projects. Upon graduation, students will receive an experience credit of one month for every 100 hours of training, and will have completed all the necessary exams with the exception of the Transport Canada administered Canadian Aviation Regulations (CARs) exam. 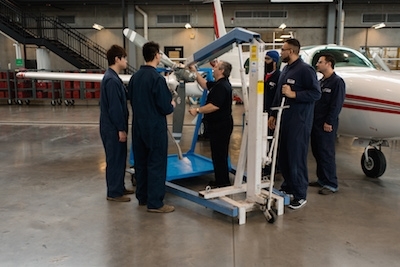 The Aviation Techniques – Aircraft Maintenance program at Algonquin College is offered in partnership with Centennial College in Toronto. Classes take place at Algonquin’s School of Advanced Technology in Ottawa. The program teaches students the knowledge and skills required to equip themselves for work in the aircraft maintenance industry. Through a series of classroom-based courses and practical labs, students in this one-year program learn to repair and maintain electrical and mechanical systems within an aircraft – hydraulics, fuels, environmental systems, engines, surface controls and undercarriage systems, and the aircraft’s frame and external skin. The curriculum also covers aviation maintenance servicing practices, and procedures and aviation regulation requirements. Graduates of the certificate program are encouraged to continue their studies in the second year at Centennial College in either the Aviation Technician – Avionics Maintenance program or the Aviation Technician – Aircraft Maintenance program. Canadore has been a leader in aviation training for more than 40 years. The School of Aviation is a dedicated aviation training facility with approximately 30 employees assigned to the Aircraft Maintenance, Avionics Maintenance and Aircraft Structural Repair programs. Courses are delivered at the college’s Aviation Campus at Jack Garland Airport. The 87,000 square foot campus includes 17,000 square feet of prime training space, and is filled to capacity with fixed and rotary wing aircraft for students to work hands-on. A New Advanced Composites, Fabrication, Repair and Test Centre is a recent addition to the campus and supports innovative technologies, applied research, materials testing opportunities and customized training programs. The college offers three basic training programs: the Aircraft Maintenance (AMT) and the Avionics Maintenance (AVN) program, and a Structural Repair (ASR) Technician program. The Aviation Technician Avionics Maintenance (“E” option) program at Centennial College will provide students with the knowledge and skills to launch a career as an aircraft maintenance technician. “E” category graduate technicians perform tasks and activities associated with the maintenance and repair of aircraft communication, navigation and data systems. The program is Transport Canada accredited for experience and exam credit towards the issue of an AME licence, and is accredited by the Canadian Council of Aviation & Aerospace as meeting the national occupational standard for avionics maintenance training. Students learn highly sought after skills relating to the maintenance, repair/replacement, inspection and troubleshooting of basic electronics circuits to sophisticated avionic systems used in modern aircraft. A significant portion of time is spent on practical application in labs. Fanshaw College is one of the largest colleges in Ontario. The school’s Aviation Technician – Avionic Maintenance program covers all aspects of aircraft avionics systems used in general aviation, corporate, charter transport category aircraft and helicopters. The course provides students with the knowledge and skills needed for servicing, repair and maintenance of aircraft electrical and electronics systems. Mohawk College | Hamilton, Ont. Mohawk’s two-year program offers students an excellent balance of theoretical knowledge and practical application. Students have an opportunity to work on a variety of aircraft including a helicopter, vintage aircraft and heavy jet transports. In addition, Kelowna Flight Craft recently donated a Boeing 727-100 for the Aviation Technician program, bringing the fleet up to 13. The Mohawk program is a living laboratory that focuses on developing key skills students will need to maintain aging aircraft as well as understand rapidly changing technologies. Nova Scotia Community College (NSCC) | Dartmouth, N.S. NCSS’s Aviation Institute, located at the Akerley Campus in Dartmouth, is a modern, 43,045 square foot training facility where students build their skills using the latest technology applied to real aircraft. The institute’s Aircraft Maintenance Engineer (Avionics) program provides the skills needed to service, maintain, repair, overhaul, inspect and test aircraft systems. Systems may include electrical power distribution, communication, navigation, data, autopilot and various instrumentation systems. Students learn the safe use and maintenance of hand tools as well as sophisticated and specialized tools and equipment. The Holland College Aircraft Gas Turbine Engine Repair and Overhaul Technology program works closely with P.E.I.’s growing aerospace industry. In this 10-month program, students will learn the techniques, procedures and documentation requirements necessary to perform the disassembly, inspection, repair, reassembly and testing of the turbine engines used to power today’s aircraft. The program consists of approximately 60 per cent practical work and 40 per cent theory. Hands-on, practical training is carried out on a variety of turbine engines, including the Pratt and Whitney Canada (P&WC) 100 series turbine engine used on the de Havilland Dash 8 legacy aircraft, P&WC PT6 and Rolls Royce 250 engines. The Aviation division of the College of the North Atlantic delivers two aerospace programs at its campus in Gander, Nfld. ; Aircraft Maintenance Engineering Technology and Aircraft Structural Repair Technician. The three-year Aircraft Maintenance Engineering Technology program offers training in fixed and rotary wing categories. Topics include the role of the Aircraft Maintenance Engineer as being responsible for aviation safety and airworthiness. Courses cover all aspects of aircraft maintenance for fixed and rotary wing aircraft and include safety practices, ground handling, inspection techniques, power plants, structural repair, aircraft systems and avionics. Upon completion, students are awarded a Diploma in Aircraft Maintenance Engineering Technology, along with an experience credit of 21 months. Students in the Aircraft Structural Repair Technician program are trained in the maintenance, repair and fabrication of aircraft structural components. In addition to training with wood, fabric and sheet metal materials, this program includes extensive training in modern composite materials. Upon completion, students are awarded a Certificate in Aircraft Structural Repair along with an experience credit of 10 months.